This truck was one of the light/medium transport vehicles used extensively by the German forces during WWII. Thanks to its reliable construction the Opel Blitz was used in many different versions. As a troop carrier, cargo – ambulance – fire – tank truck and even as a platform for anti-aircraft guns. Widespread was the use of the field command and communications truck equipped with various radio and antenna units. Italeri is a prolific model company based in Italy. They manufacture all manner of model subjects in the popular scales. 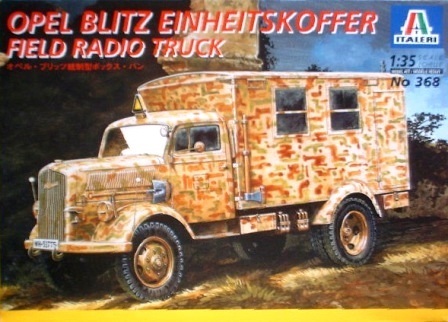 The box art shows a field radio truck parked in a woods. It has a base of sand with small blobs of medium green and military brown spots over it. A black weight information stencil is on the cab doors and the license plate number is WH 53775. One side panel of the box has one paragraph histories of the vehicle in English, German, French, Italian, Spanish, Dutch, Swedish and Norwegian, all marked with color illustrations of the flags of the countries that speak those languages. The kit makes up to be 171mm in length (just short of 7”). The other side panel continues with the histories in Portuguese, Czech, Japanese and Chinese. The kit was made in Italy and the copyright date is 1999. 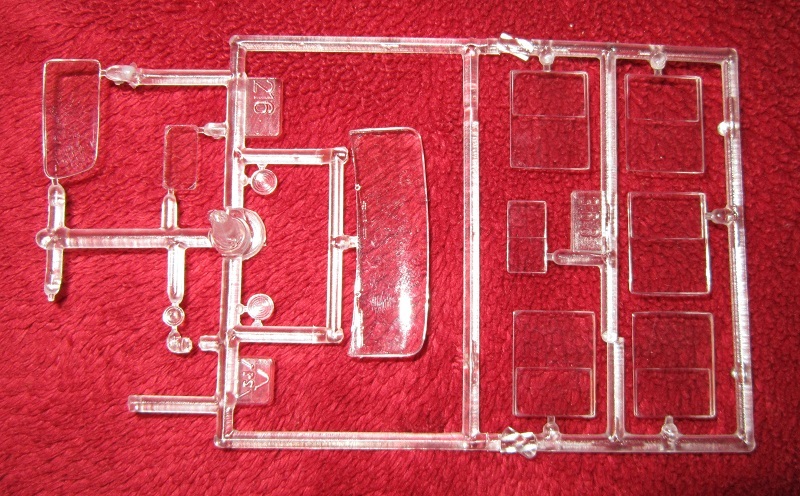 The kit is designed for modelers over 10 years of age. Model Master brand paint color numbers are listed, but not what those colors are. The kit is said to be not suitable for children under 3 due to small parts that may accidentally be swallowed by them. This is warned in 20 languages including English. This kit contains 2 large tan parts trees that fit the box tight on all sides and a small tan tree. There is a clear parts tree and a tree of black vinyl tires. The decal sheet and the instructions complete the kit’s contents. The instructions consist of a single sheet that accordion folds out into 10 pages in 8 ½” x 13” page format. Page 1 of the instructions begins with Italeri’s street address in Italy, followed by the history of the truck in 12 languages, including English. Page 2 begins with “Attention – Useful advice” about the kit in 11 languages, including English. Below this is parts trees illustrations of the 2 large tan trees, the clear parts tree and the tree of black vinyl tires. Some parts are shaded out in these illustrations. Meaning these parts are excess and not needed to complete the model. Page 3 begins with a parts tree illustration of the small tan tree. A list of Model Master brand paints is given. The colors are told this time and also the FS numbers for these colors is provided. Below these is the first 2 assembly steps. Page 4 through 7 give a grand total of 11 assembly steps. Page 8 has a 3-view marking and painting scheme for a truck in Russia 1944. No unit is mentioned though. It is in the box art scheme (already described above). At the bottom of the page is the decal application instructions in 9 languages, including English. Page 9 has another 3-view for a truck in France 1940. It is overall white. Markings on both schemes are only called out with the numbers the marks are on the decal sheet and an arrow pointing to where they are placed on the model. 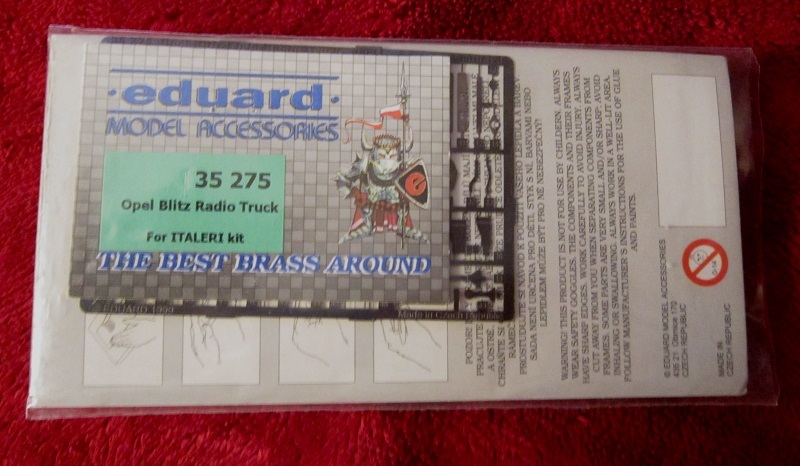 Unfortunately, I lost my decal sheet over the years that I’ve had this kit. I hope I can contact Italeri and request a replacement….sigh. Page 10 has “Important information concerning this kit” in 20 languages, including English. There are no crew member figures of PE parts. The inside of the radio room is void with no details. 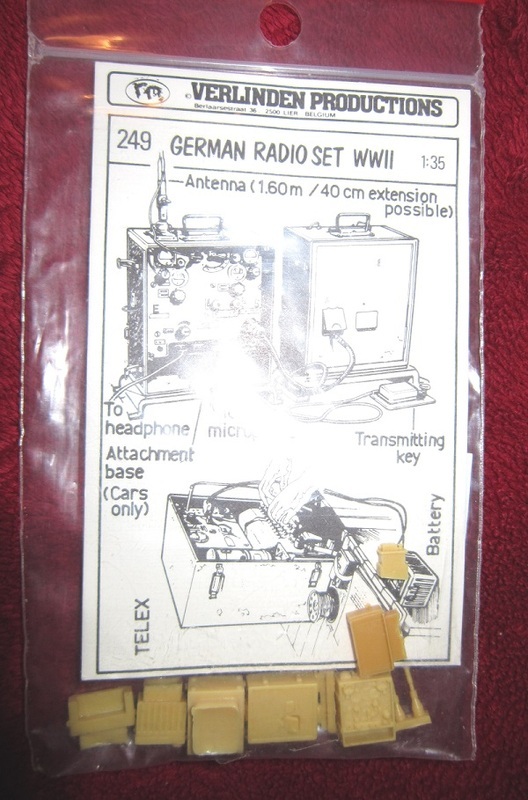 Because of that lack of details, I purchased the Verlinden Products brand resin German radio set (kit no. 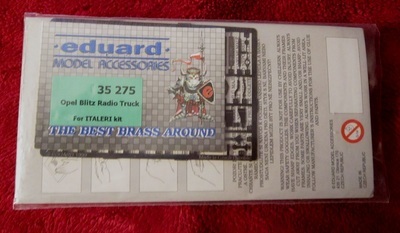 249) and the Eduard brand PE set no. 352375 that is designed SPECIFICALLY for this Italeri kit. A set of 8 black vinyl tires completes the kit. This kit should make up nicely by adding the after-market parts I have and finding some chairs, tables, a driver figure and some radio operator figures to add. Highly recommended otherwise. I purchased my kit at my local hobby shop back in the late 90’s. It is out of production but may be found places on eBay perhaps.